Is a Mandala Tattoo for You? The mandala is a spiritual symbol found mainly in Buddhism and Hinduism. It means circle in Sanskrit. The design is loaded with designs and it is usually drawn from the center towards, following a symmetrical pattern. It can be colored or black. Before you carry a mandala on your skin, check out if this type of design is for you. A mandala is not only a beautiful symbol to look at, it is a tool for meditation. Those who carry a mandala on their skin tend to be very deep, as the goal of this symbol is to silence purposeless and distracting thoughts, allowing the observer to be more aware. Also, the center of the mandala represents the inner self. If you are seeking to refocus on yourself and in harmony with the world, then this is a perfect tattoo choice for you. A mandala tattoo can be placed in many spots on a person’s body. However, since this type of tattoo has a geometric structure, it is best to get it in a flat section of your body. On the upper part of a shoulder makes the design seen when you wear a strapless dress or sleeveless shirt. In the middle of your back, at the spine level is a great location for a getting two mandalas. For colorful designs, the arms are a great spot. Another preferred choice for the arm is a subtle and small mandala tattoo. Colorful or watercolor designs look amazing on the leg and calf. 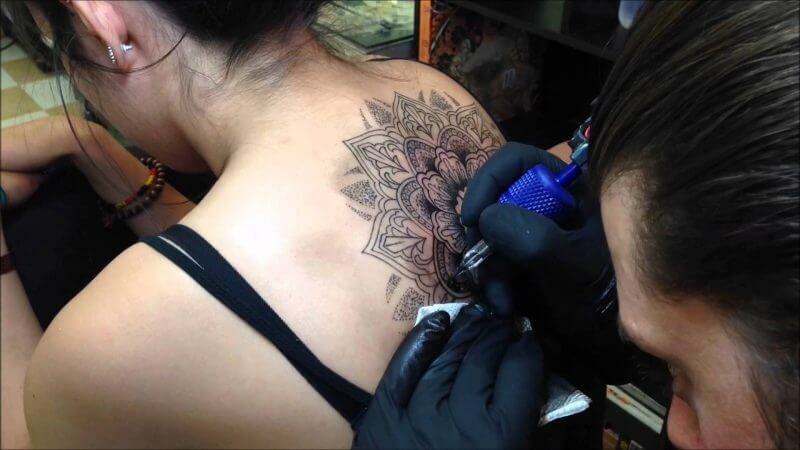 The area under the breasts has become more and more a trendy area to get a mandala tattoo. You can get a beautiful half of mandala with your partner, so when you hold hands, the design matches and looks whole. Finally, now we are seeing people getting a mandala on the back of the neck rather than paws like it used to be twenty years ago. 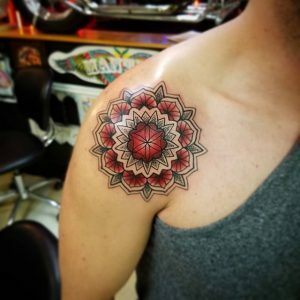 When you are ready to get a Mandala tattoo in Denver, come to Mantra Tattoo. We have a team of professional artists who can do an amazing job. Check out their tattoo gallery to get inspired.